NVCYE Program is a volunteer organization. We do not receive any external funding from government or non-government sources. We run our program from the fees collected from volunteers. We need fees in order to run our organization and to run the community development program like orphanages, school (re) construction, nurseries, eco-tourism center etc. We also support local partner schools and other partner organizations by offering material help. Some of the projects we support are School renovation and construction, Conservation and Nursery development, Orphanages and kindergartenandSchools and eco-tourism project. We sincerely request our volunteers to respect local culture, people, and social norms. They should not feel uncomfortable about the living and working conditions in Nepal (as described above). Volunteering requires a lot of patience, discipline and effort. Be open-minded, flexible and adaptable to new situation and culture. Respect the culture of other people. Please always keep in mind that the placement in host families is not meant to be like a stay in a hotel. It is therefore important to follow the family rules at all the time; this is also a gesture of showing your appreciation towards the host family for their hospitality. NVCYE does not cover any liabilities for accidents or injuries that occur during the project period. In the case of unforeseen circumstances (such as sickness or lack of physical fitness) it is volunteer(s) responsibility to pay for all additional costs. Volunteers who arrive prior to their program’s scheduled start have to pay themselves for the additional accommodation at a hotel that as well as for their meals until the program begin. Alcohol is strictly prohibited during the whole project period. Smoking is not allowed during the language class. 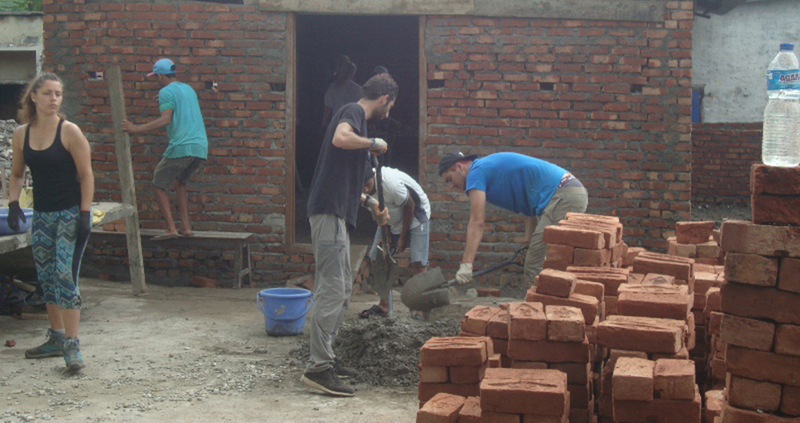 We cannot accept volunteers who only come to Nepal to have a good time and who don’t like to do any voluntary work. Volunteers who refuse to work in their projects will be expelled from the program (see basic rules) without a refund of program fees. PROGRAM covers airport pick up, in- country transport, food and accommodation. NVCYE PROGRAM does not cover expenses related to visa extension, personal travel, gifts to anyone etc. NVCYE Program strictly does not offer “exotic food” (such as dessert, hot chocolate), soft drinks, mineral water, and gums during the whole program period including the trekking. We serve three meals a day (normally Nepalese dishes). NVCYE Program does not cover expenses for soft drinks, exotic food, mineral water, gums, or other personal expenses during the project period or trekking. NVCYE Program uses express bus services for the transportation of the volunteers. These bus services are the most reliable means of transport in Nepal. We do not offer transportation in luxury tourist coaches. NVCYE Program strictly does not provide food and accommodation in its hostel during and after the completion of your project. Rather NVCYE Program arranges for up to two nights free accommodation in Thamel. This is only applicable in the case of a visa extension or an official visit. Your luggage will be transferred to the place in Thamel where you are going to stay. Please inform NVCYE Program in advance about your visit by phone or e- mail. If you are going to leave any belongings at NVCYE Program’s office, please always put on it a tag bearing your name. Your luggage will be transferred to the place in Thamel where you are going to stay. Do not leave any valuables unattended. NVCYE Program takes no responsibility for damage and loss. Please shut doors and windows properly when going out or to bed. Please switch off the electric light when leaving the room or going to bed. Inside the building smoking and the consumption of alcohol are strictly prohibited. You are not allowed to enter the building after 7.30 p.m. So please inform us in advance in case of late arrival. Breakfast is at 8.00 am, Lunch from 12.00-1.00 and dinner is served from 7:30-8:00pm. Internet service and international phone facility are not available at NVCYE Program’s office. Please consult with class teacher regarding the availability of the following services in Kalanki: e-mail, internet, bank, post office, letter posting etc. Nepal has a diverse climate; summer is normally hot and humid and towards the end follows the rainy season. Winter is cold in the morning and evening but warm during the daytime. The temperature drops during winter nights. All volunteers are requested to come with cloths according to the season. Months of fall and spring are wonderful. All rural roads of Nepal are not paved. Work place is usually dusty and you have to do physical work. Therefore, we recommend all participants come with washable footwear and light comfortable footwear for evening walks and other leisure activities. Volunteers are requested to come with working clothes (old and comfortable), gloves and other necessary equipment. Summer is hot and the sun is very strong. To reduce sunburns, it is best to come with an appropriate hat to wear during the day. It would also be wise to bring 15+ sun block lotions. Most of the volunteers will be involved in physical work; therefore volunteers are requested to come with working clothes (old and comfortable), gloves and other necessary equipment. Summer is hot and the sun is very strong. To reduce sunburns, it is best to come with an appropriate hat to wear during the day. It would also be wise to bring 15+ sun block lotions. Although malaria has been eradicated from Nepal, mosquitoes are still around us. Therefore, to reduce the problem of mosquito bites, volunteers are requested to bring their own mosquito nets. NVCYE PROGRAM will manage basic first aid kit; it is always useful to carry a small personal medical kit. This should include: plaster, personal medication to last the duration of the program, fungicidal foot powder/cream, antiseptic cream, mild painkiller, aspirin, tweezers, scissors etc. Normally, good insect repellents are not available in Nepal. If you are allergic to insect bites please do not forget to add insect repellent in your kit before you leave your country. Although Nepal is not a malaria-infested area, we recommend you consult your doctor before you depart from your country. We request you to take immunity shots of, malaria, Hepatitis A/B, Tetanus. NVCYE Program does not cover any insurance, please ensure that you have international travel, medical and injure insurance. All members will be informed of the risks and safety procedures for their specific placement at the orientation class held at the NVCY PROGRAM office. Please do not forget to pack a torch (flashlight), camera, film and other necessary stuffs.